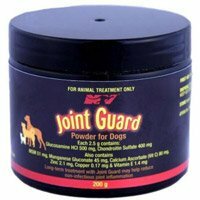 Joint Guard powder for dogs is a clinically proven treatment for joint problems like arthritis, injury and normal wear and tear. Manufactured by combining Glucosamine hydrochloride and Chondroitin sulfate in specific proportions, the powder is highly effective for aging, injured or overactive dogs. Apart from curing joint problems, it also reduces frequent cartilage damage. When administered at a younger age, it prevents possible joint problems in younger dogs. This ‘no smell and no taste’ powder containing essential vitamins and minerals is palatable and easy to administer. This is working amazingly well because I can see that elder dog is moving easily from before. This powder was recommended to me by my friend, who used on his dog for curing joint problems. Now, he is better than his old self again after using the joint guard.